It is one of the oft-old tales in the three-decade (!) history of Madden NFL: When Trip Hawkins, the founder of Electronic Arts, approached John Madden, the Hall of Fame coach and broadcaster, about collaborating on a new version of video game football, Madden stipulated that any game with his name on it would include 22 players—11 on offense and 11 on defense—on the field at the same time. Anything less was not, in Madden’s view, real football. It’s time to call John Madden’s bluff. If 11-on-11 is the only way to play football, then Madden NFL should become a 22-player online multiplayer game. Until that happens, it’s not real football. Playing Rocket League this summer reminded me that sports games can simulate the perspective—and summon the joy—of being an actual athlete on the field of play, rather than the role you play in Madden: a godlike coach-quarterback hybrid who can possess any member of his alien Borg. Madden NFL should feel more like Rocket League and less like managing Mother Base in Metal Gear Solid V. Football is a turn-based, class-based multiplayer game of area control. In the hands of the right designers, a video game version could make playing right guard as rewarding as playing quarterback, wide receiver or running back. John Madden and the designers at EA Tiburon believe they are devoted to making their eponymous football game as realistic as possible. When I traveled to California a few years ago to watch football with Madden and some of the game’s designers for a Wired story, Coach Madden made three complaints about that year’s iteration of the game: He thought Minnesota Vikings running back Adrian Peterson should be given a 99 rating (instead of a 98), he thought the game needed to improve where it placed the referees on the field during plays, and he wanted the designers to come up with a way for punters in the game to use end-over-end spin to land a ball near the end zone (the so-called rugby kick) instead of angling the ball toward the sideline (directional kicking, a punting style that is no longer in fashion). As those suggestions demonstrate, there are two distinct types of realism for Madden NFL. One, the game wants to simulate the rules and physics of professional American football so that couch-bound fans can feel what it’s like to play the sport. Two, the game wants to simulate the feeling of watching professional American football on television. (Moving the refs to more accurate spots would boost the game’s verisimilitude for spectators without altering the way the game plays.) Those twin goals aren’t always in conflict. Putting 22 virtual players on the field, for example, satisfies both. Sometimes they are competing aspirations, however, and too often the designers of Madden NFL—prodded by the guy whose name is on the box—have chosen the second kind of realism over the first. They handed players a game that lets you experiment with new ways to play football, under the same rules and physics that constrain coaches and players in the NFL. 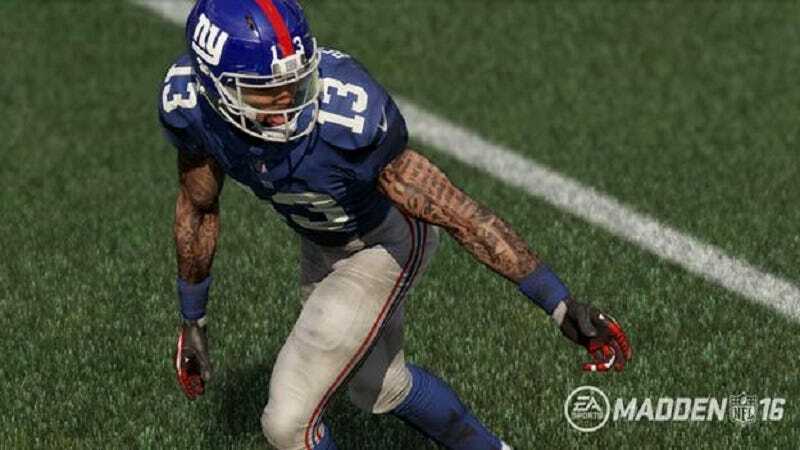 Yet instead of celebrating the strategies and styles that emerged by letting players simulate millions of football games, Madden NFL has traditionally preferred to slap its players on their wrists for doing things differently. In the most notable example, Coach Madden grumbled one year that players weren’t punting often enough, and so the game arbitrarily made it harder to convert plays on fourth down. The football in Madden NFL was starting to look different—more fun, and maybe smarter, according to some research—than the football in the NFL. That just wouldn’t do. Turning Madden NFL into a 22-player, class-based esport would be a move in the opposite direction. It would be an attempt to create a video game that simulates the feeling of protecting your quarterback’s blind side as a linebacker tries a speed rush, or the feeling of blocking the secondary downfield so that your running back can break a big gain. Like football, Madden NFL could be a game about collaborating with your allies amid a big, confusing swirl of systems, a game about planning and executing with your teammates to win. The game would have to be rebuilt from scratch, basically, to create incentives for players to train for less glamorous positions, especially the offensive line. It would be worth it. Blocking in Madden NFL should be at least as fun as tackling. Think of the left tackle as the healer of Madden NFL, the class for players who want to protect their allies rather than smite their enemies (although on the offensive line in the actual NFL, conveniently, you get to do both). This wouldn’t be unprecedented. EA Sports has experimented with 11-on-11 online multiplayer modes for FIFA, but as every American knows, soccer isn’t real football, either. Is this too bold, too dangerous for a staid and stolidly successful series like Madden NFL? Probably, alas. But it’s an even better idea for Rocket League 2.